Hanging out with your squad is something we always want to do, but the question always arises — where do we go? Well, here are some of our suggestions on where to chill with your friends in the city. Social is everybody’s favourite hangout spot and even we can vouch for that! Eat, drink, chill, party and even play, all three of the Socials in Bangalore have something for you and the squad to do. You can come here for a meal and stick to staples including the Black Pepper China Box and the Loaded Nachos or maybe try something different, like the Jalapeno Mac and Cheese or the super-sized OMG Burger. Couple this with a nice drink from their selection of signature Long Island Iced Teas or maybe have a cold beer to go with the perfect Bangalore weather. Friends, family or a date — Social almost certainly tops every hangout list in the city. An oldie but always a goodie, Airlines hotel is well known for its cool ambience, forever crowded area, and good food and is one of the city’s iconic coffee and old-school eateries. They’ve been in the same spot for 48 years and the charm is still alive. Come here for a hot coffee and sit in your car/on your bike and have a dosa or idlis. And after gorging on the food here, walk a few steps to the Corner House in the vicinity for ice creams. This is a hangout spot for the generations. Bangalore’s favorite ice cream parlour is almost 40 years old and still, people run here for their Death By Chocolate, doused in loads of chocolate fudge and nuts. The taste hasn’t changed through the years and we all still love it the just the same! Grab a bunch of friends, come to Corner House and feast. Maybe you could even have a small ice cream challenge to try something new, if you haven't tried the whole menu yet. “Boss, one pitcher and one beef chilly!” is something we’ve heard quite a few times when we go to Pecos. And don’t we all love to spend our afternoons and evenings here! To say Pecos is legendary is an understatement. A lot of us grew up coming here and a lot of us are growing up coming here. Known for their beer (you get it everywhere, but it just tastes so good here), great music and the spicy food — perfect for Bangaloreans and others alike. This can be a new place for you guys to come and check out with your buds. Work together and crack your way through the entire course, which tests your brain, your team compatibility, and your patience (in a good way). Choose between a jail escape, bomb defusing scenario, murder mystery and abduction escape. A group of four can book a challenge at Mystery Rooms, for INR 700 per person on weekdays and INR 800 per person on weekends and public holidays. 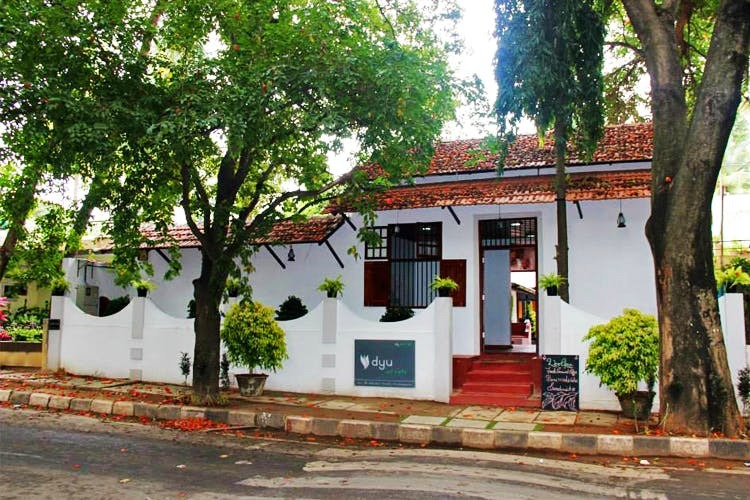 An art gallery, a cafe and sometimes even a workspace, Dyu Art Cafe is a peaceful, serene spot in Koramangala where you can come with your friends and relax for hours and hours. They have a selection of paintings and drawings hung all around the cafe and the two levels with the greenery, and ample space to chill. From their all-day breakfast to the dessert, there’s a lot on the menu. Have the banoffee pie and the chocolate cake, dripping in chocolate sauce. To drink, you can sample their collection of coffees and teas.